Here it is… The first post I ever created on “Baking It Real”. This is still one of my favorite recipes and I tweaked it a thousand times before I felt it was ready for it’s big debut. I hope you enjoy it again! So I decided that in order to solidify my place as a note worthy blogger I would share with you; a favorite cake recipe. Not just any kind of cake though, “Red Velvet Cake“, also known as “Devil’s Food Cake”! I find this recipe particularly interesting because, it has a great story, it’s easy to make, and tastes really good. It’s also a fun one to impress your friends and relatives with so go ahead give it a try! There are a number of websites out there claiming to know the history of red velvet cake but it remains a little enigmatic for me. Although, the story is funny so I’ll tell it anyway. 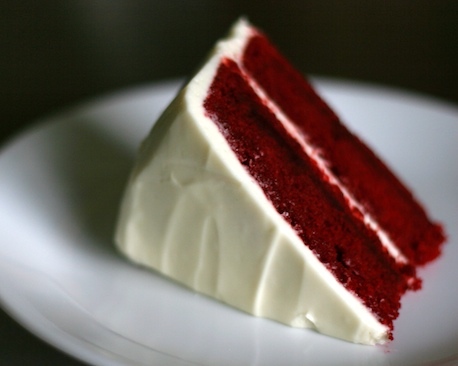 In the early 1920’s a women tried red velvet cake for the first time as a guest at the Waldorf Astoria Hotel. Before leaving the hotel she decided she wanted a copy of the recipe and requested a copy from the hotel’s head chef explaining that she would like to purchase a copy of their recipe. She received a copy of the recipe before leaving and upon checking out she also received a bill from the head chef for $200. Furious over the fee for the recipe she quickly shared it with everyone she knew, even passing out copies on the train on the way home! Guess she got her revenge because red velvet cake did become very popular over the next several decades, and is now a staple in bake shops and cupcakeries all over the world. Many of the recipes for red velvet cake call for obscene amounts of red food coloring (and I mean obscene 4-5 BOTTLES in some recipes!) others call for far less, and some chefs believe the original recipe had none at all! So where does that beautiful red color come from? … Drum roll please…. Simple chemistry. I know a little anticlimactic right? Early forms of cocoa powder contained large amounts of anthocyanins (natural red pigments). This naturally occurring acid reacts with the acids in the buttermilk, and vinegar to produce a bright red color! Ta Da! Red velvet Cake. Like wise these anthocyanins will react with bases like baking soda to produce a rather unappetizing greyish green color so beware the baking soda when working with cocoa. Commonly found cocoa powders today are known as “Dutch processed” cocoa’s, some of their anthocyanins have been stripped away and so they do not provide such a profound color change; so the modern day chef began helping it along with a little or a TON of red food coloring. Almost all of the recipes you will find today contain the same essential ingredients, Butter or shortening, flour, cocoa, sugar, buttermilk, and vinegar. Most of these ingredients are common pantry items, and you should have just about everything they need to make a great red velvet cake. I have a hard time finding Buttermilk though, it’s not a common ingredient in most kitchens anymore so here are two ways to make your own buttermilk, or at least a suitable substitute. Place cream into an air tight container and shake. It will form into whipped cream and eventually butter solids will form. Remove the butter solids and voila! the remaining liquid is none other than the ever elusive buttermilk you’ve been looking for! Start with your vinegar in a 1 c. measuring cup and add the whole milk allow to stand for about 5 minutes and use interchangeably as buttermilk. Easy and less expensive. Preheat your oven to 350 degrees. Grease and flour two 9 inch baking pans line the bottom with parchment paper and set aside. 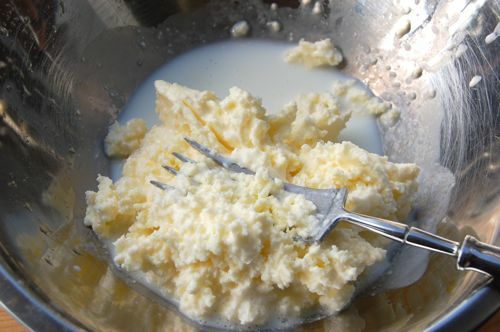 mix shortening and sugar together once creamy add the eggs blend well. In a separate bowl mix the food coloring and cocoa together into a paste, and then add to the shortening mixture. Mix salt, vanilla, and buttermilk together, add alternately with the flour starting with the flour first until all well incorporated ( yes it will have a Willie Wonka red coloration don’t worry) Mix baking soda and vinegar together in a separate bowl and then fold into the batter. The chemical reaction between the vinegar and baking soda will give your cake a little lift making it light and fluffy. Pour evenly into the two prepared baking pans and place in the preheated oven for 30 minutes. Remove from the oven and allow to cool completely then split the layers, stack with cream cheese frosting in between the layers and frost the outside. Mix together until smooth. Refrigerate for about 30minutes before using for best results.